This was bottled in August 2012 and I’ve had it opened for quite a while. It’s been a very enjoyable whisky and one of the first recommendations from my friend, Sorin. Wonderful nose with lots of stone fruits, cocoa, cereal, honey, straw, sweet tobacco, toffee and lemon drop. At 53.8%, it’s got the expected burn as well. A bit of water tames the burn and serves to emphasize the fruits a bit with dark cherry and plum being prominent. The first sip brings a burst of dark stewed fruit, cocoa, straw, honey and a bit of tobacco. Further exposure reveals lemon pie filling, straw, honey and a bit of old leather. The mouthfeel is full with an oily coating leading to a leathery finish of black pepper, cocoa and candied ginger. With water I get more pepper… some white and black that carry through to the finish. The fruits become lighter and more vibrant without losing the balance of cocoa and tobacco. It takes water really well, which serves to subdue the fruits while bringing out the cocoa powder. You can experiment with the water or keep adding drops to gain a new experience with each one. This is what makes a whisky fun and enjoyable. This whisky is an excellent example of cask strength, sherried single malt. Most of the Glendronach cask strength offerings I’ve had have been similar and I highly recommend them. This bottle was around $150 a few years ago, but you should expect to pay more than $200 for newer bottles today. If you can’t find one, then try their 15 Year Old Revival at about $90 instead (discontinued last year, but still available), as it’s also a very nice whisky. 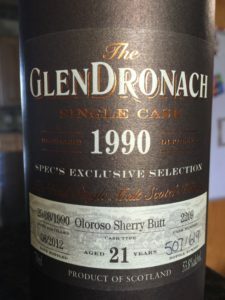 This entry was posted in Whiskey and tagged Glendronach, Single Malt, Speyside. Bookmark the permalink.